The Intex claims that it is unrivaled in the market, and at first, I thought that this claim was totally unwarranted. I didnt see anything that I thought really made it the must-have-purchase for the British consumer. How wrong I was! Continue reading to hear about how this reviewer had to eat her words. 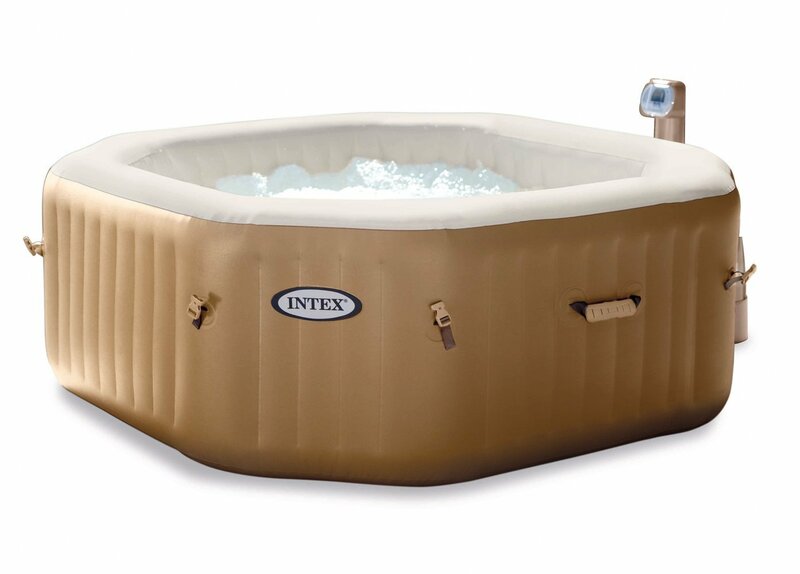 When I was testing the Intex Octagonal Bubble Spa alone, I found it hard to find any one component that really made it stand out against the rest. 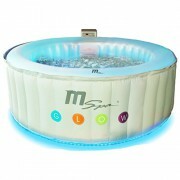 It’s a good size, the massage jets are both relaxing and powerful, and the water temperature gets up to the standard 40 degrees. I felt that the product was lacking anything unique. However, my view changed dramatically when I invited three of my girl friends over to enjoy it with me. The thing that had originally seemed to me merely an asthetic break from the norm, its shape, took on a wholly different meaning when I was enjoying the spa with others. The first thing I noticed was that I was no longer brushing against other people, I had my own section totally to myself. I was able to relax fully against a flat panel, which was nicely cushioned and I didn’t need to constantly readjust myself. The instructions state that this product is suitable for up to 4 adults, and for once the spec is right! Each of you has your own private section and you can stretch out and relax without constantly asking yourself the inevitable question – Am I taking up too much room? You may be asking yourself how the above relates specifically to its size and in a way you would be right in thinking – not a lot. 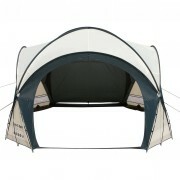 The Intex fits 4 people, which is not loads as I am sure you would agree, but it is the style in which it fits four. It isn’t trying to get the most people in, it is trying to make sure that the people it does fit have the most comfortable and relaxing a time as possible. Obviously, I would not recommend the Intex for large families, and I would strongly dissuade anyone from buying this and trying to squeeze as many people as possible in it. 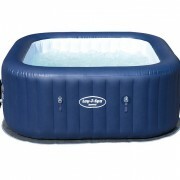 This tub is designed for four and in my opinion, it is the most comfortable spa I have tested when you are using it at its full capacity. 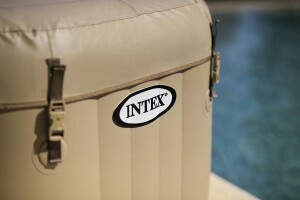 The Intex is very similar to other tubs I have tested in that it heats to a standard 40 degrees. There is a handy control panel where you can set your own ideal ‘relaxing temperature’. Me and my friends decided to set ours a lot lower than 40, not only because it would take longer to get there, but also because anything above 30 in my book is a bit overpowering. Plus, we were having such a good time with the massage jets, which really ARE very powerful, that to leave after 30 minutes due to heat exhaustion seemed a bit of a waste. So, into the nitty gritty – the Intex is pretty good for us Brits as it is only recommended you pack it away when outside conditions drop to temperatures lower than -4 degrees celcius. Although our winters seem pretty tame it’s important to remember that the temperature at night, when the tub isn’t on, can get pretty chilly, and it may be better to pack it up from December through to March. As the tub is really easy to set up, you can always move it indoors if the desire to ‘spa’ overcomes you on Christmas Eve, or Valentines Day! The Intex heats at roughly 1.5 degrees an hour which is again, standard, so you may want to fill it with hot water to kick start the process. Something me and my friends noticed after about 2 hours of getting wrinkly, is the Intex doesn’t switch off the heater when the bubbles are on. This is actually pretty rare, and is a welcome change from the norm of having to turn off the jets and wait for the temperature to get up again. If you are like me, and a bubble fanatic, this feature will really make a difference – trust me. 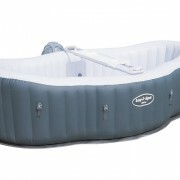 If you have read any of my other reviews you will understand when I say that most of the inflatable hot tubs available on the market are easy as pie to set-up. As with others, there is a DVD to follow and once you have found it’s ideal spot in your garden (preferably as far away from the prying eyes of the neighbours), and put down the ground sheet, your tub will be inflated within 20 minutes of opening the box. Fill it up using the garden hose, set your ideal temperature using the control panel, and leave it to do its thing. I cannot emphasise enough for those ludites out there reading this and thinking, ‘oh dear, I’m useless with anything technical…’, you do not need to worry. Setting one of these up makes operating a new washing machine seem like rocket science. With the Intex, as with any product containing a large amount of water, you need to be careful when you have small children. This is a given, and I am sure that I am not saying anything that parents won’t already have thought of. The inflatable lid that clips into place can give you some peace of mind, but I cannot stress enough that this should not be used instead of adult supervision. Make sure to clip this lid on whenever you are not using the tub, as it’s handy at stopping leaves and bugs from making their home in the water. I have had the misfortune of forgetting, and a family of dead flies are not the ideal bathing companions. Be warned. The Intex does not stand out in the technology it uses, or its heating system – but undoubtedly it stands out from the crowd in how it looks. As I have already mentioned, and cannot seem to stop talking about, It is not round. This really does make a huge difference, as me and my three girl-friends can attest to wholeheartedly. 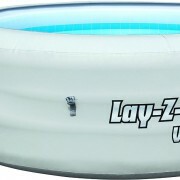 Another added feature that will come as a welcome surprise, is that it includes a built in hard-water-treatment system. What is this, you ask? Well, let me just say that for those of us that live in an area with hard water, which is a large proportion of Britain if I am not mistaken, it will feel softer on the skin and on the swimming stuff we wear in the tub. You may also notice a difference in the amount of foam and bubbles that the Intex produces, and this is again due to the soft water. Don’t ask me about the science, but apparently this is the case. Whether this last bit is true or not, the hard water treatment system can only be a good thing. From very humble beginnings, my opinion of the Intex has gone from strength to strength. It may not be the hottest, it may not be the most aesthetically pleasing, but I tell you now that I have not enjoyed the space and comfort of a tub as much as I have enjoyed this one. 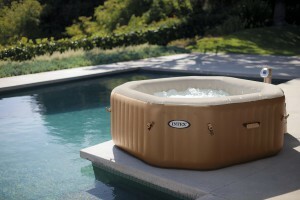 The fact that you get your own little slice of heaven in the Intex is something that I never even realised that I wanted or needed, but now that I have had it – I can’t imagine enjoying another spa to the same degree.